O. Vincent Haleck is a member of the Second Quorum of the Seventy of The Church of Jesus Christ of Latter-day Saints. He was sustained on April 2, 2011. He was presiding over the Samoa Apia Mission at the time of his call. 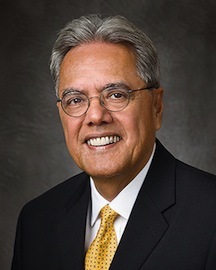 He is the first general authority from the Samoan Islands. Haleck was born on January 19, 1949, in Utulei, American Samoa. When he was ten years old, his parents sent him to Seattle, Washington, to live with his aunt and uncle in order to have an education. He joined the Church in 1966 while attending high school and living in California with his grandmother, who was a faithful Latter-day Saint. He served as a full-time missionaray in the Apia Samoa Mission. He later served as a bishop, stake president, stake high council, and patriarch. He baptized his father on his 80th birthday. He earned his bachelor’s degree in advertising and marketing from Brigham Young University. After he graduated, he and his wife moved back to American Samoa. He was president of Tuna Ventures, Inc., and Tropical Beverage Distributors, Inc. He owns businesses in Samoa. He and his wife, Peggy, are the parents of three children. This page was last edited on 30 November 2015, at 15:01.